Summon: Put three random Shouts into your hand and reduce their costs to 0. 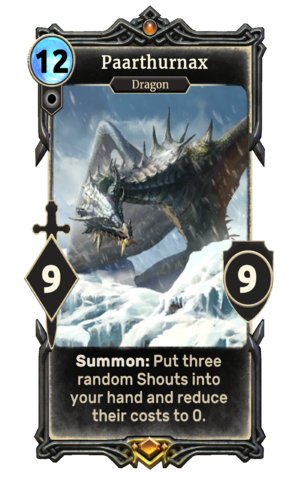 Paarthurnax is a unique legendary Neutral creature card. It is part of the Heroes of Skyrim expansion. In addition to the card's availability in the Heroes of Skyrim expansion, one copy is included in the Paarthurnax's Roar theme deck. Paarthurnax first appeared in Skyrim. For more information on Paarthurnax, see the lore article. "Drem Yol Lok. Greetings." is Paarthurnax's usual greeting in Skyrim, and the part of it in Draconic translates to "peace fire sky". "Yol Toor Shul" is the shout for Fire Breath. This page was last modified on 27 February 2019, at 19:34.